July | 2013 | ReconfigurED. A Storify of our #STACCE13 & #ISTE13 study tour experience. In capturing some extended thoughts, reflections, learnings and memories from our recent #STACCE13 study tour, I thought I would create a Storify of select tweets and photos from the trip. It has been enjoyable to sift and pick out the key learnings and moments from each part of the tour and curate them into one journal. I hope that you, the viewers, enjoy reading about our experiences. View “The 2013 ACCE Study Tour ( #STACCE13 ) to #ISTE13” on Storify here. One of the highlights from my recent study tour to the USA and attendance at the ISTE13 conference was the an interview and informal chat with Anthony Salcito (@AnthonySalcito). Anthony runs a blog called Daily Edventures (a 365-day look at innovative education). As Vice President of Worldwide Education at Microsoft, Anthony works with education institutions and partners on a global scale, and believes that “innovation in education is a worldwide challenge“. We met Anthony when our study tour group visited Microsoft in Seattle. Anthony was also attending ISTE13 in the following week. Narrisa Leung (@rissL, a fellow Victorian on the study tour) and I were invited to share our learning experiences from the study tour, as well as our insights into the Australian and American education system. Despite our obvious passion for technology, when Anthony asked us about what would be a our most memorable take away from the study tour both of our sentiments reflected “peopleware” rather than specific elements of technology itself. Crucially, the biggest push in educational technology integration needs not to be the technology itself, but the professional development for teachers, the relationships, the pedagogy, and leadership for all stakeholders. You can read and view the full interview at Anthony’s blog from this link. One of the featured keynote speakers at the ISTE13 conference was Jane McGonigal (@avantgame), director of Game Research and Development at the Institute for the Future. In her keynote titled “Learning is an Epic Win”, Jane revealed the dynamics of gamers worldwide, and the potential of engaging gamers for a higher civil purpose. Prior to hearing Jane speak I thought I knew a little about Game Based Learning. For the last few years #GBL seemed to be picking up pace in educational circles. At the conferences I have attended in the past few years, there have been various keynotes and presentations advocating games for learning in increased urgency. I would say that I have been mostly sceptical for a few reasons. With this in mind, vendors are increasing to offer services, platforms and content in the form of “engaging” games. These are often offered as shining beacons of answers to effective and efficient student development of outcomes. However, for obvious reasons, there’s something about sitting a student in front of a game and expecting magic to happen that doesn’t sit well with me from a educationalist point of view. At the risk of sounding overly negative about games, I can assure you that I’m not. I’m an avid gamer myself, and have been engrossed in digital and physical games since I could talk. I have been sceptical though, about the benefits and opportunities of GBL; and more importantly, how it is best integrated to support learning. For this reason at recent conferences I had elected to attend sessions where presenters would give insight into how they have been using GBL as the vehicle for learning. The use of minecraft as a platform seems to be a popular choice. Unfortunately, of the sessions I have attended at ICTE13 and ACEC12, the examples seemed to lack rigour, purpose, and student outcomes tied to curriculum. I don’t think that minecraft can be justified as a worthwhile exercise for students on the basis that the kids are having fun, therefore it’s worthwhile. It might be argued that they are developing communication and collaboration skills, but where is the content? The purpose? The close integration of knowledge and learning? I love games, and there is no doubt kids love games. But I’ve always been wary of its justification in teaching and learning. After Jane’s keynote at ISTE13, I felt there was hope for making sense of GBL. Still not completely sold, I decided to purchase Jane’s book: Reality Is Broken: How Games Make Us Better and How They Can Change the World for further pursual. And I’m very glad that I did! In fact I have enjoyed this book so much, that I thought I would write a blog post about it. It has been inspirational to the point where I think other educators, interested in GBL or not, should take note of the themes from this book. Because whether we advocate games or not, Jane reveals that there are 183 million active gamers in the USA, closer to home in Australia it’s 15 million, and worldwide close to 1 billion. In Jane’s words: This is “creating a massive virtual silo of cognitive effort, emotional energy, and collective attention lavished on game world’s instead of the real world” (pg4). Collectively, the planet is spending a staggering 3 billion hours a week in gaming. Jane explains that these hours are fulfilling genuine human needs that the real world is currently unable to satisfy. In the USA, 97 % of youth play computer and video games (pg5). Whilst one out of 4 gamers are over the age of fifty, the average game player is 35 and has been playing games for 12 years (pg5). However, today’s students live and breathe a digital world and expect to consume video games. What’s behind a” good” game? Games have a goal, rules, feedback system, and voluntary participation (pg21). These determine how effective a game is. Jane quotes Bernard Suits in revealing that “playing a game is the voluntary attempt to overcome unnecessary obstacles” (pg22). This is precisely what is fun, motivating and rewarding about playing games. Games are fun, but shouldn’t only be looked at as escapism. Rather, Jane reminds us of Brian Sutton-Smith’s words: “The opposite of play isn’t work. It’s depression” (pg28). Jane describes Fiero as “the italian word for ‘pride’…it is what we feel after we triumph over adversity…we throw our arms over our head and yell” (pg 33). She also goes on to cite studies that confirm that “Fiero” moments are one of the most powerful neurochemical highs we can experience. It made me think about whether our students experience enough if any “Fiero” moments in their learning. Are they being stimulated, challenged, satisfied, and rewarded with genuine highs in the classroom? Students should be craving satisfying work, with the hope and experience of being successful, just like in games. So do we take note of this, and design lessons accordingly? Or use games as the vehicle for this type of learning? Gamers spend 80% of their time failing, and still love what they are doing (pg64). The culture and mindset of failure in the classroom here plays a big part in embracing learning opportunities and persistence to higher goals and achievements. The nature of games is that the gamer still wants to persist in order to reach that next target. “If we are forced to do something, or if we do it half heartedly, were not really participating. If we don’t care how it all turns out, were not really participating. If were passively waiting it out, were not really participating” (pg124). These 3 eloquent sentences summarise what it actually means to be participatory. This quote made me think about how teachers allow or disallow students to direct their own learning; learning where students are self-motivated and self-directed, and where interest and genuine enthusiasm is fostered. This is a large positive of GBL because students have to voluntarily participate in the game, therefore they immediately become effective participants if they are interested. Jane provides examples of how games of alternative realities can have motivational effects in the real and physical world, for example Chore Wars, Quest To Learn, and Super Better. Other interesting games include Jetset, Day in the Cloud, The comfort of strangers, Cruel 2 Be Kind, and Top-Secret Dance Off. Investigating Your MP’s Expenses is an example of what people are capable of when collaborating through the power of technology. Jane points out that Wikipedia has required crowd sourcing to the tune of 100 million hours of thought. That is like rounding up a million people and asking them to contribute 100 hours to Wikipedia, for free. Or persuading 10,000 people to dedicate five full time work years to Wikipedia. As Jane puts it: “That is a lot of effort to ask a lot of people to make, for no extrinsic reward, on behalf of someone else’s vision” (pg225). Jane argues that with 1.7 billion internet users, it shouldn’t be hard to pull off projects to the scale of Wikipedia. “If the right motivation could be provided, we should be able to complete 100 Wikipedia sized projects every single day” (pg225). Jane provides examples of GBL networks of people to make a difference, for example Folding@Home, Free Rice, Lost Jules, World Without Oil, and Evoke. In light of Jane’s book, I don’t think I will look at the potential of games and student learning in the same way that I used to. In particular, I have been amazed at what Quest To Learn are achieving in the way that they are structuring their teaching and learning around GBL. However, I still think there is the danger of laying games over existing lesson plans and expecting magic to happen. This is not gamification! In convincing others about what GBL could offer for education, I am predicting that most hesitant educators, particularly those who have largely grown up without video games, will continue to deem video games as a distraction from our real lives, and therefore irrelevant. To a large point, living our reality is important. However, we can now think of games as having much more potential than just entertainment that serves as a disconnect from reality. As Jane argues in the final chapter: “games don’t distract us from our real lives. They FILL our real lives: with positive emotions, positive activity, positive experiences, and positive strengths” (pg354). Thank you Jane McGonigal for refreshing my views on GBL! If you haven’t already done so, I highly recommend Reality Is Broken: How Games Make Us Better and How They Can Change the World as your next read! Have you read “Reality Is Broken”? What are your thoughts on GBL? Over 2 weeks have past since the conclusion of ISTE13, which is probably just enough time to shake the hangover from so many learning opportunities and insights into what was a epic 5 day experience. Exhausted and jet lagged, I’m happy to be back in Melbourne; but I have now decided it is time to make a concentrated effort to post about our study tour experiences at ISTE13 after our industry and school visits in San Francisco, Seattle and Vancouver. Before leaving the tour, I was given sound advice from the ACCE president Tony Brandenberg, who offered that the conference needs to be done in byte-sized pieces. These words could not have been truer. ISTE13 was an amazing learning opportunity for any one who was in attendance, in both a physical sense and digital sense. With so much to do and see, you do run the risk of feeling overwhelmed by the scale of the conference (particularly if you are a first timer like me). At the same time, it meant late nights and early mornings. It meant full on schedules during the day by running from place to place, and switching modes cognitively from listening, to sharing, to collaborating, to discussing. Nevertheless, I found ISTE13 to be both thought provoking and inspirational. I came across this great blog post which summarises the top 10 conversations at ISTE13, which gives good insight into some of the themes that were emmerging from keynotes, sessions, and thougts from attendees. Jane McGonigal (@avantgame) is a designer of alternate reality games, and was the first keynote speaker at ISTE13 with “Learning is an Epic Win”. Jane alerted us to the fact that there are now 1 billion active gamers around the world, and provoked us into thinking about how games could be used to solve real world problems and engage students in meaningful learning. I particularly loved her point about the nature of games and failing, in that a lot of gamers spend their time failing to reach the next level or required target. Yet these gamers persist and continue to try and try again. Why would gamers spend time, energy and money to play games to only fail time and time again? It made me think about the motivations behind the dynamics of games, and how these can be utilised for educational experiences. Jane offered a list of 10 positive emotions that games evoke, which really summarise the engagement and potential that games offer. If we could find even just a small way to use games to leverage educational content to evoke even some of these emotions with our students, I think we could make a big difference. Jane McGonigal communicating the wide impact of games globally. 10 positive emotions from gaming. Of the many sessions that I attended, a favourite of mine would be Helen Barrett’s (@eportfolios) workshop Create Interactive E-Portfolios Using GoogleApps: Docs/Drive, Picasaweb, Blogger, Sites . This year we introduced a 1:1 laptop program in our senior years, with the aim of using Google Apps to allow students and teachers to connect, publish and collaborate. Helen’s session was very valuable for me at this point in time in order for us to take the next step with Google Apps with our students, as they are well on their way to familiarising themselves with Drive and using Documents. For the last few years we have already been placing the emphasis and importance for students to self-reflect, collect and manage evidence and reflections of their own learning with what we call “Personal Learning Folders”. I look forward this term to digitising these in a more efficient and effective way with our students in the form of an e-portfolio that can be viewed and celebrated by all students, teachers and even parents. Helen’s site is a terrific resource of her expertise with eportfolios. 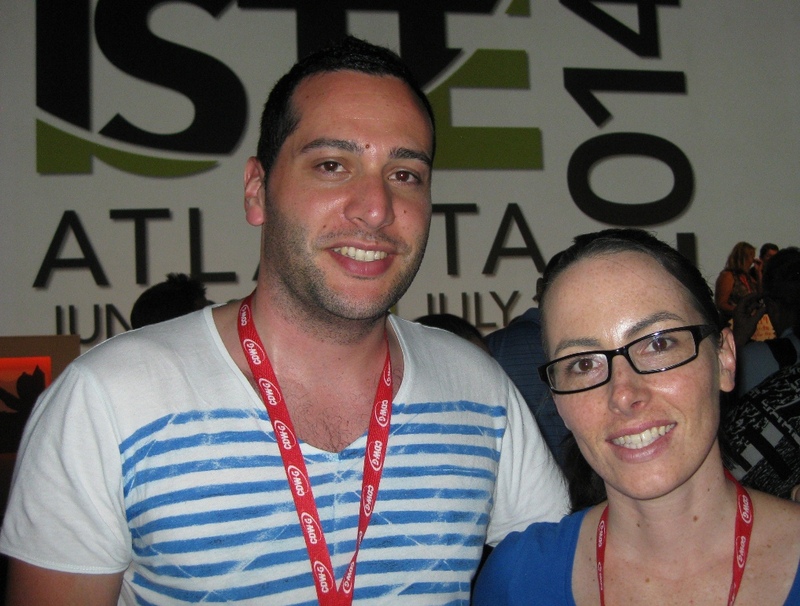 One of the spotlighted sessions at ISTE13 was the Iron Chef challenge. A fellow compatriot on the tour (@rissL) and I decided to have a go at this, and we were very glad that we did. The Iron Chef Challenge was organised by the Young Educator Network. The idea of the Iron Chef challenge was to collaborate together with a group of people to solve a problem. You can read about the intent of this idea and the process behind the scenes at Krister Moroder’s (@edtechcoaching) blog post. The problem came in the form of several ingredients which had to be used to form a creative solution. The solution was to be presented to a panel of judges and would be scored. @rissL and I teamed up with Michelle from Arkansas (@buckaress) and Lynda from Texas (@lswanner1) to form Team Naked Techs – “Keeping ideas simple and fresh, Jamie Oliver style!” (see the full list of teams here). In our scenario we pretended that we would be applying our ingredients to a 1:1 laptop program that wasn’t going very well for students and teachers. We then had to come up with ways to solve the problem using only $12,000, our time, skills, and ideas. We got to collaboration straight away. We decided to use Google Presentation for our slides. We set up a Google Doc to make notes of our ideas. We used Google Draw to make pictures of our dishes (solutions). Naturally we ran out of time in session but we could still work together later at night from our different hotels. We also drew on each other’s areas of expertise, abilities, and professional experiences. The time came for us to present our idea (you can see all presentations here), and I’m proud to say that Team Naked Techs were declared joint winners along side Team Cruncheez! It was such a thrill to win the ISTE Iron Chef Challenge, and it was great to work together in a group of other like-minded individuals. I learnt a lot by listening to everyone else’s ideas about their problems and creative solutions. As mentioned in @edtechcoaching‘s blog post – the words “Connect, Collaborate, Create” are served as a constant reminders of learning opportunities that should be offered to our students. But do we practise what we preach? The Iron Chef challenge was a creative way of getting the educators to experience these words in a real sense. Best – keynote – ever! Adam Bellow (@adambellow) is the founder of Educlipper and EduTecher. Hands down, this was the best keynote I have ever experienced. Adam was passionate, captivating and enthralling all at the same time. He was incredibly fast paced, enjoyable, and his use of visuals were extraordinary. At one point, I couldn’t take notes any more because I was just so captivated in what was happening. Below are a series of tweets that I managed to blurt out in between being in total awe. These, for me, represent some of the most resounding points from Adam’s keynote. I was humbled that I actually got to meet Adam in person a few days earlier at the ISTE Welcome Reception. He was nice enough to let me try on his fancy google glasses which he wore on stage when he delivered the keynote! Adam Bellow is just one connection that ISTE13 has enabled for me. ISTE13 was a wonderful conversation starter and enabler of connections with so many other educators and like minded individuals. The little conversations here and there, the opportunity to come together in networks of people with a common cause, and being part of a massive movement in both a physical and digital sense has been awe-inspiring. I was challenged and engaged in many deep thoughts and conversations. For me, this reaffirmed Amanda Dykes’ (@amandacdykes) point that the most important thing in education today is people. Some of the sessions at ISTE13 were recorded and can be seen here. The ISTE youtube channel has a collection of other videos that are also worth checking out.